Everyone loves a good garage sale!! I set up a little booth at my parent’s house at our annual neighborhood garage sale that attracts hundreds of people from all over during a 2-3 day period. 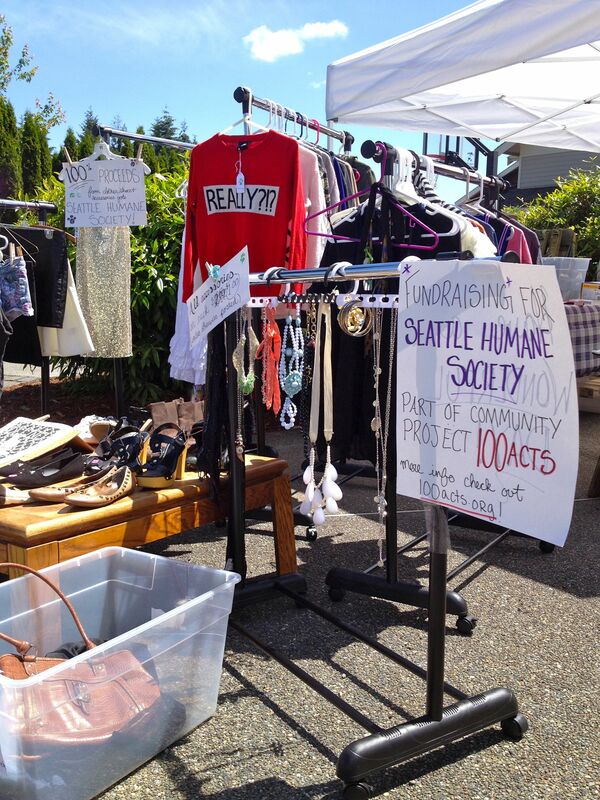 I didn’t have much to sell – a few racks of old clothes and shoes – but all the profits I made are going to The Seattle Humane Society. I had a lot of fun setting up the booth, making little tags for it, and talking with people about the SHS. 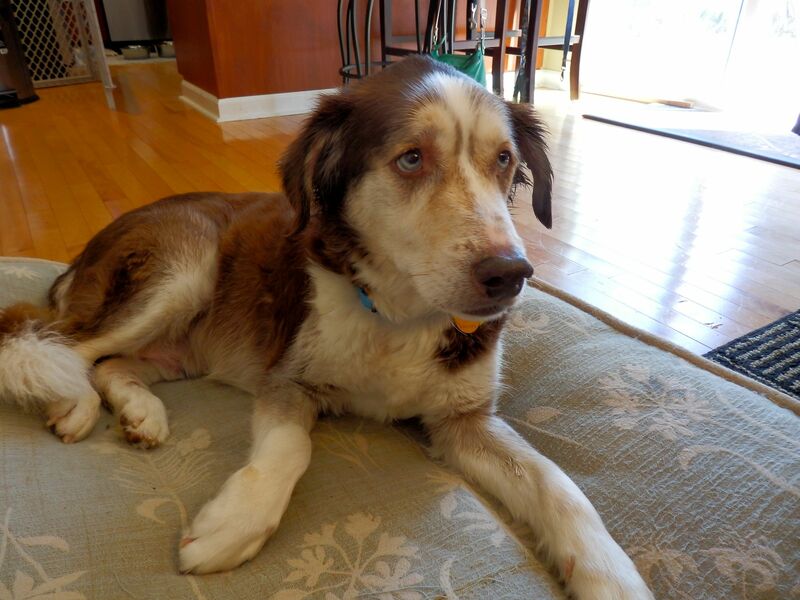 I actually met a wonderful selfless human who is a rescue dog foster mom as well as a entrepreneur. She bakes healthy pet treats from her own kitchen and sells them online. 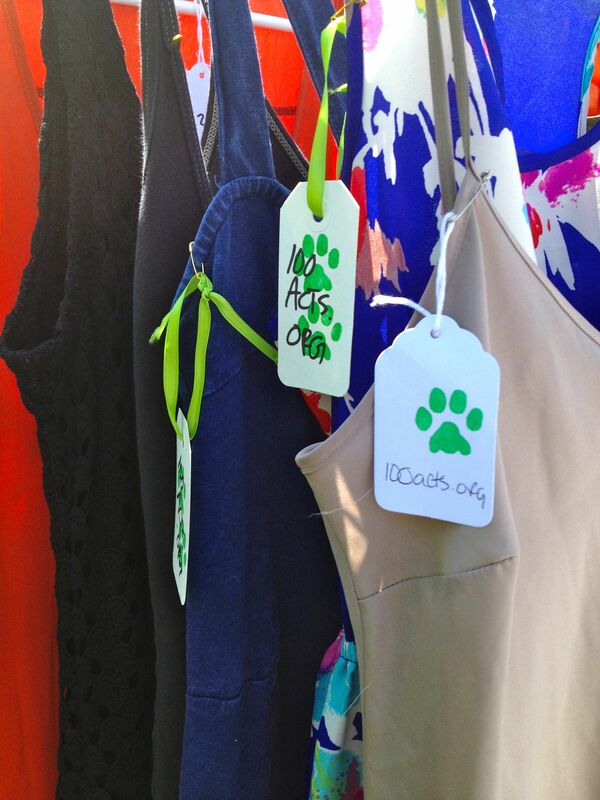 Her company is called Stubs and Tails- check it out here! 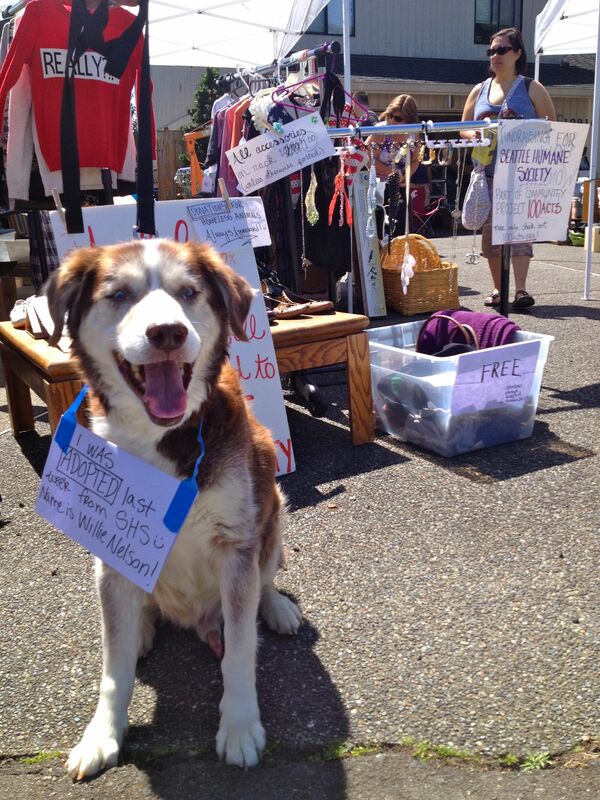 Willie Nelson became a mascot for my little booth and everyone loved to give him lots of pets, love and attention. 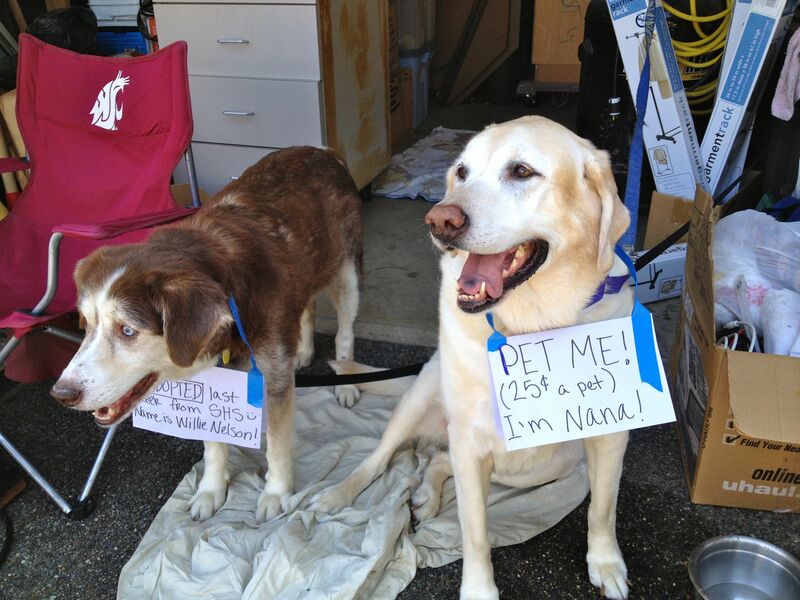 I made a sign for Nana too (although some of the kids didn’t know it was a joke…I let them pet her for free (: ). I reached my personal fundraising goal and then some and found that there are a lot of generous and kind people in our community. It was a lot of fun conversing with people and it gave me hope that one day I can open a booth of my own selling secondhand items in the name of charities at flea markets. Hopefully one day soon! 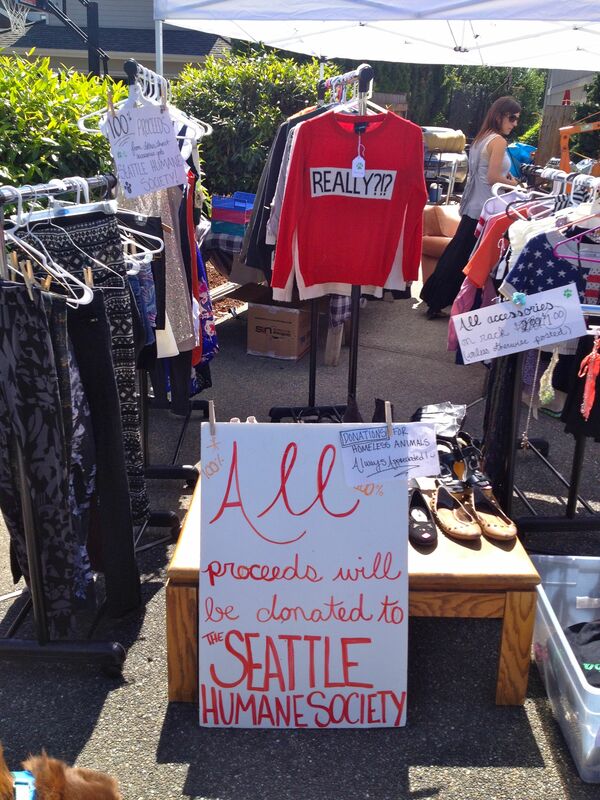 It was a beautiful weekend so it made the work effortless and fun to sell secondhand clothes in order to raise money for the SHS. I didn’t raise a massive amount of money but the profits I did make came from people who genuinely want to help out the animals needing the shelter’s love and care. All in all it was a small and successful act that was fun to put on and will help make at least one life better at the Seattle Humane Society. Thank you to all the kind people and loving animals out there! In honor of Mother’s Day yesterday this post is dedicated to my mother (and father).